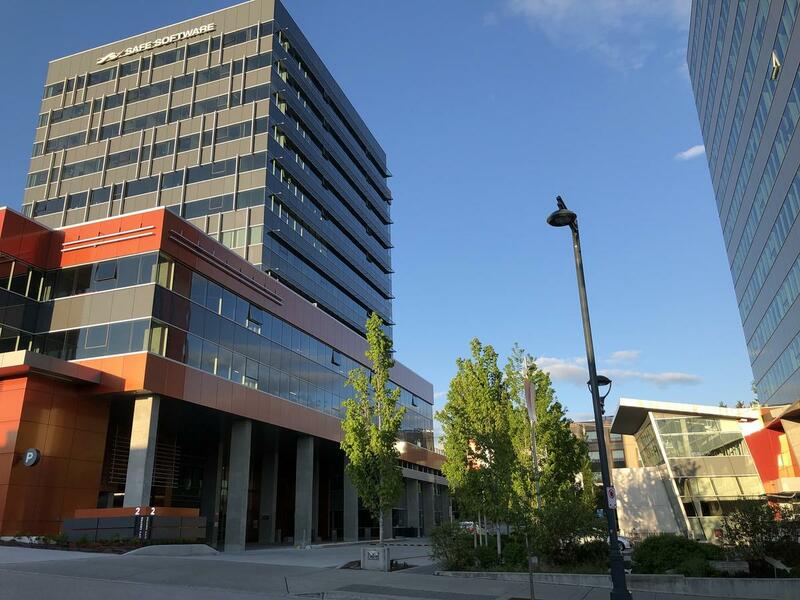 Anthem Properties’ announced on Tuesday the acquisition of new 4.4 acre site at 10232 Whalley Blvd on the corner of 102 Avenue. 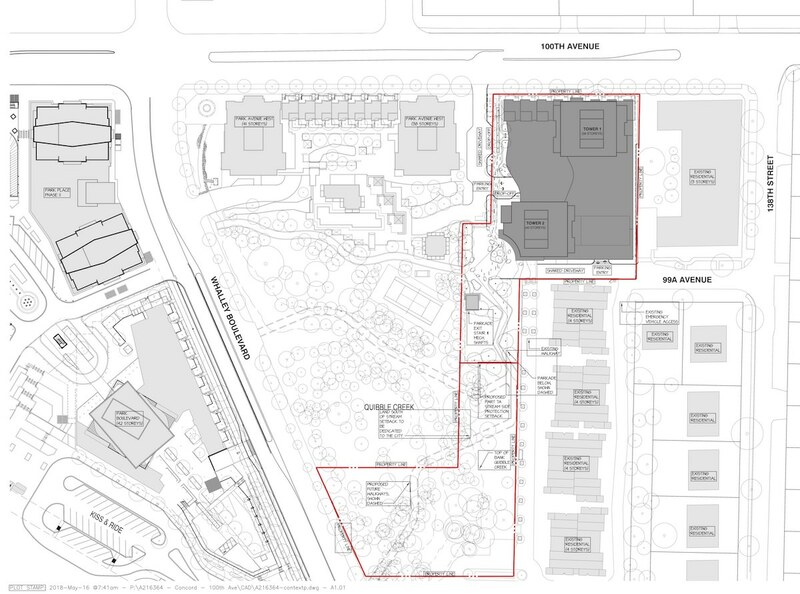 The site is currently occupied by a Toys R’ Us and Dollarama, and is located directly across the street from the developer’s soon-to-be underway ‘Georgetown’ master-planned community – which received preliminary approval for Phase 1 back in April. 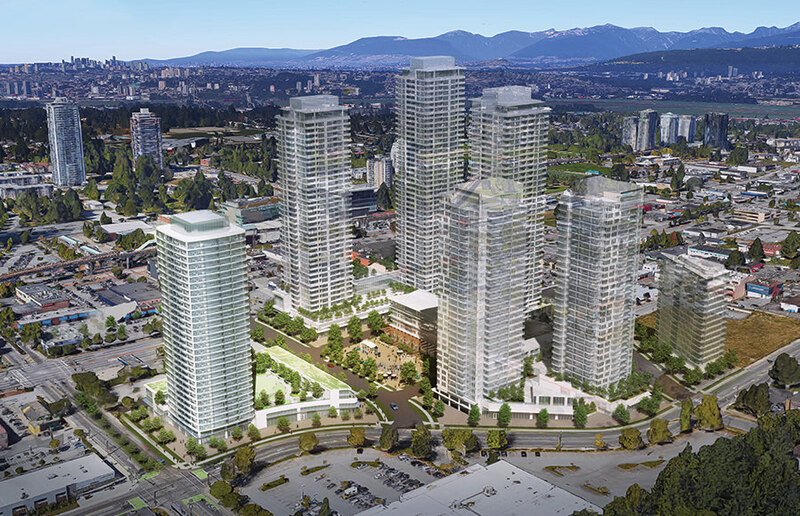 In the news release, Anthem notes that they plan on submitting a development application for rezoning of the site in the near future, to allow for a new ‘master-planned residential community’ in line with the City Centre Plan. 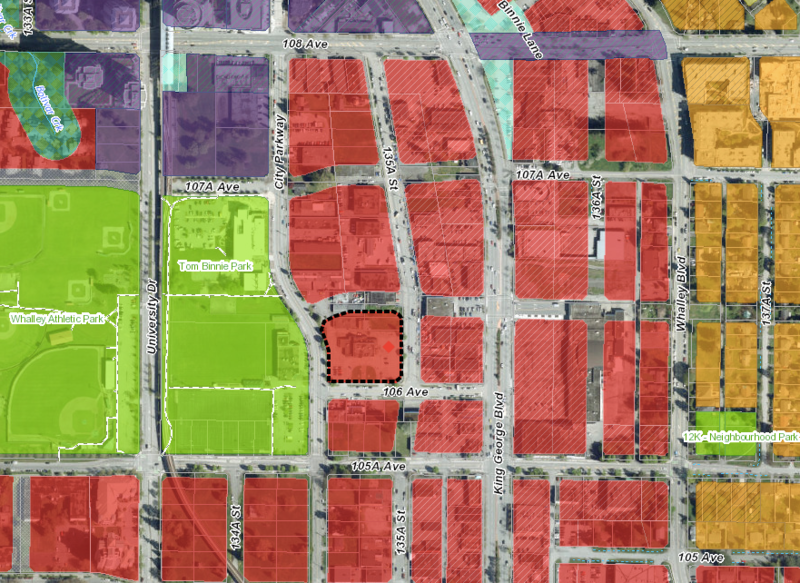 The site is currently designated ‘Mixed-use / Mid to High-Rise 3.5 FAR’, similar to ‘Georgetown’ across the street, but is likely to see lower towers heights as a transition away from the core to lower density designated lands to the east. 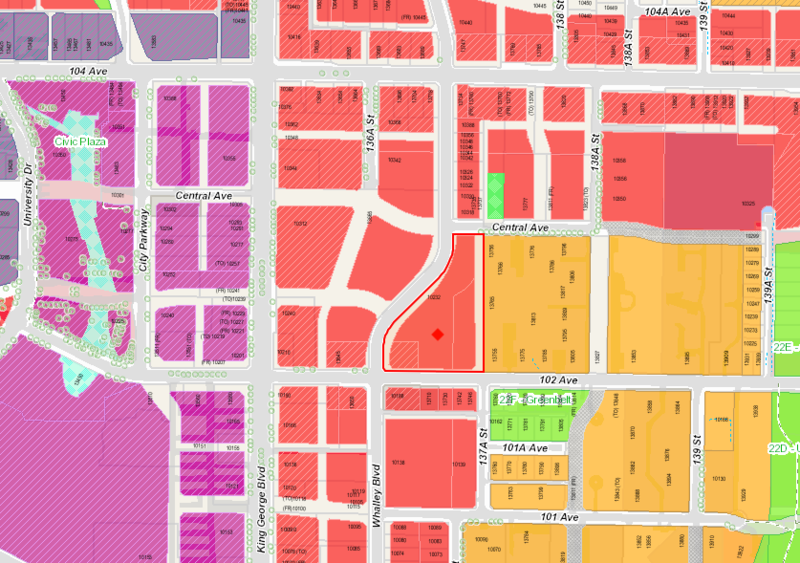 Anthem’s proposed ‘Georgetown’ master-planned community on existing Canadian Tire / Save-On Food siteIt is unclear whether the new acquisition will become an extension of ‘Georgetown’ or be marketed as a stand-alone development. 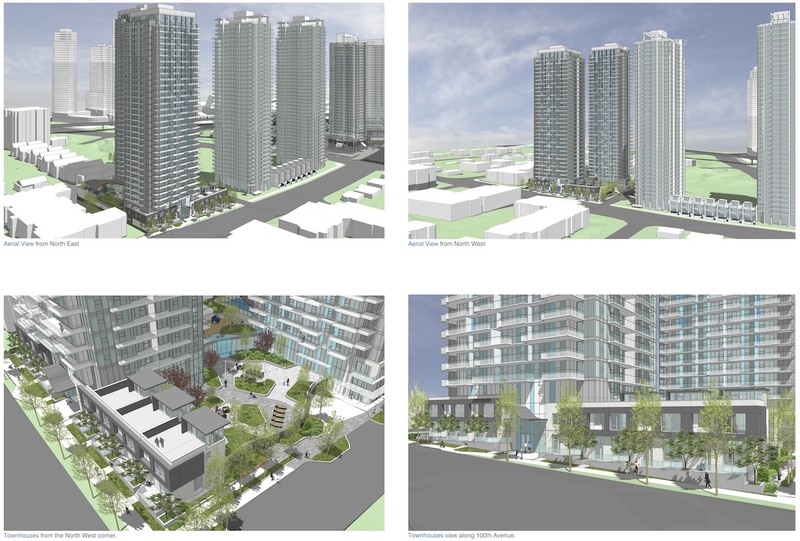 Also unclear is how the project will fit into the anticipated decade-long phasing of Georgetown’s 7 towers across the street – whether the project will come to market concurrently with one of those phases or be marketed after the build-out of Georgetown. 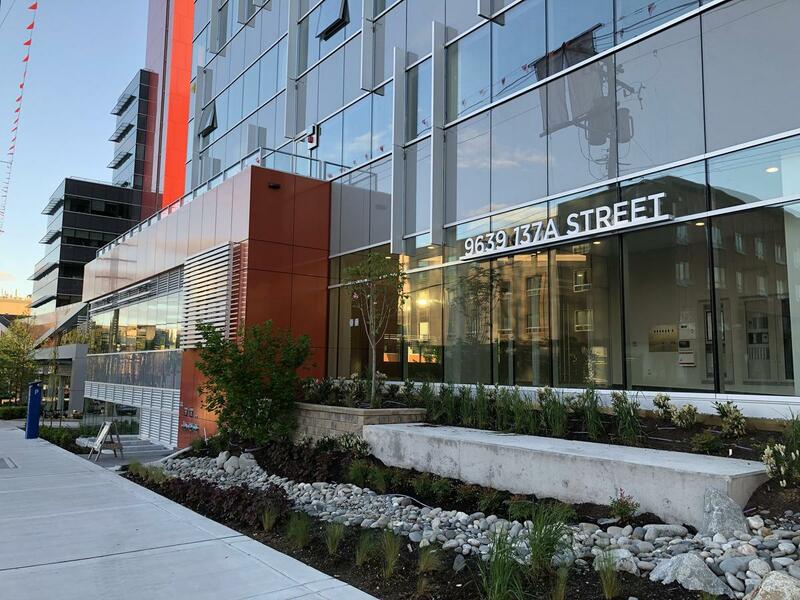 Bosa’s BlueSky Properties received 1st & 2nd readings by Council on Monday night for their upcoming, recently re-branded, ‘BlueSky’ project at 104 Avenue and University Drive. 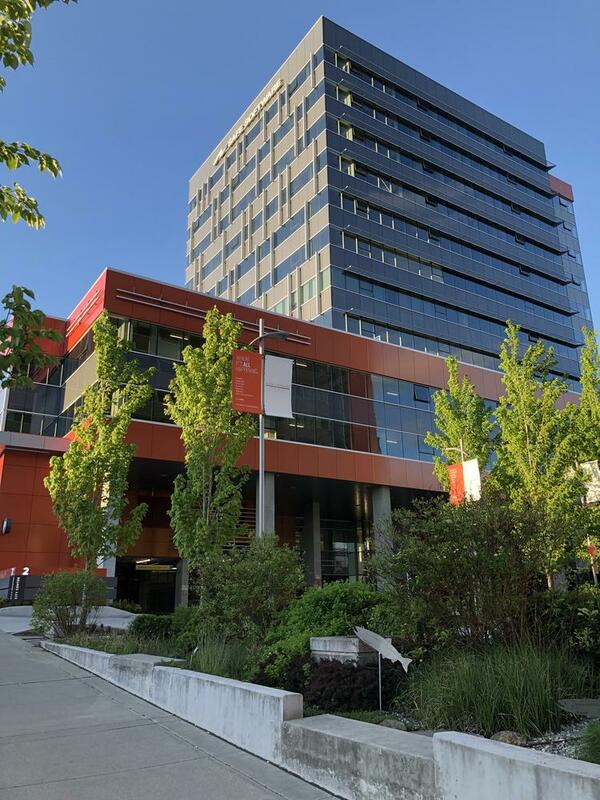 The project, previously thought to become the next phase of ‘University District‘ is now set for Public Hearing and 3rd reading (preliminary approval) on July 9. 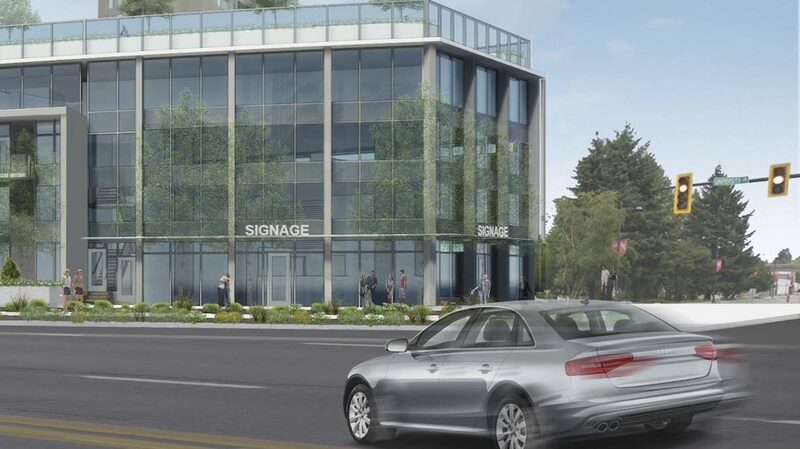 Released in the Planning Report to Council on Monday were updated renderings for the project, superseding a previous design from the original 2011 application on the site. 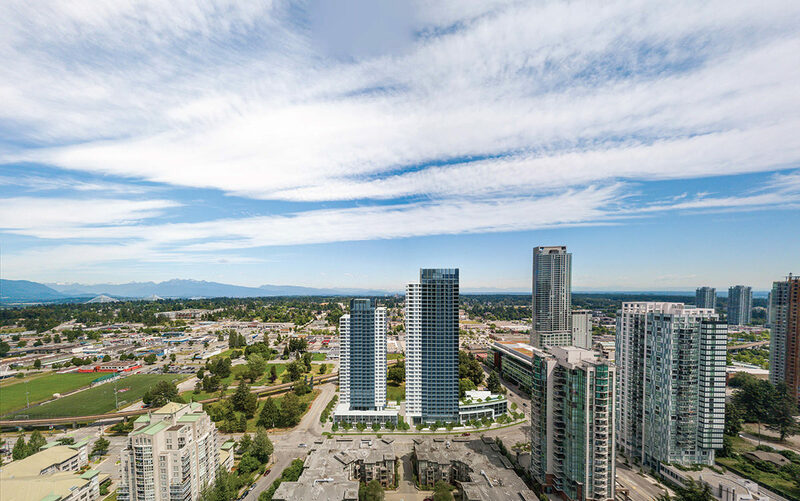 As part of the new 2018 application, tower heights have increased to 28 & 37 storeys, and incorporate a more contemporary ‘box-shaped’ architectural design. In addition, a new north-south lane will be dedicated along the site’s eastern property line, as per the City Centre Plan, helping to achieve a finer-grained road network. Rendering of amenity podium with ground floor retail and rooftop pool at 104 Ave & University DrDesigned by Vancouver’s ZGF Architects, the two condo towers will contain a total of 742 units above a 3-storey townhouse base fronting both 105 Ave & University Dr, and 4-storey amenity podium with ground floor retail and rooftop pool at the corner of University Dr & 104 Ave. 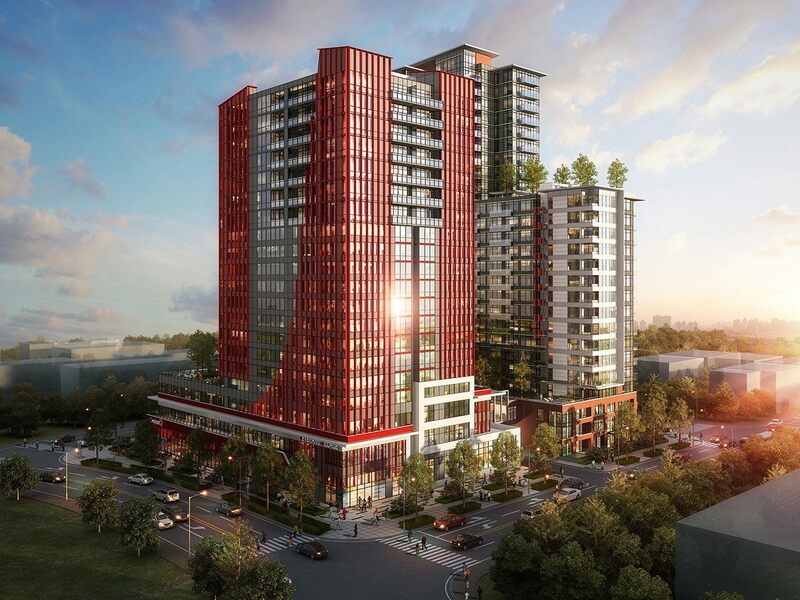 The project will create a strong urban streetscape along both University Dr and 105 Ave, and help transition density further northward from the city’s emerging civic core. 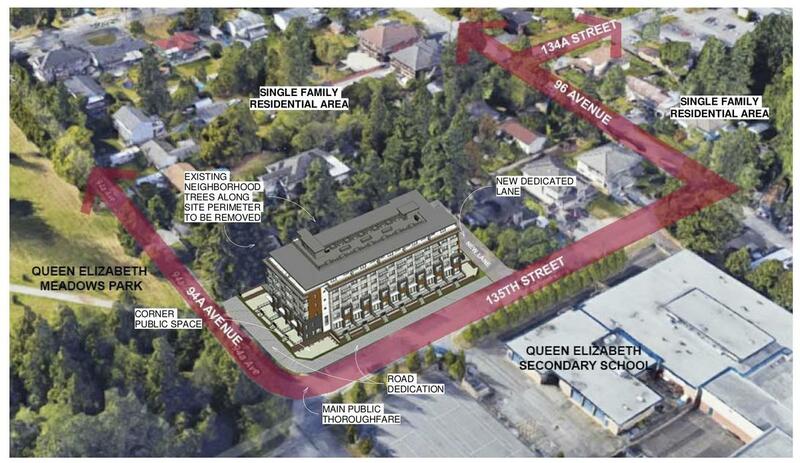 The project is targeted for completion and occupancy by summer 2022. 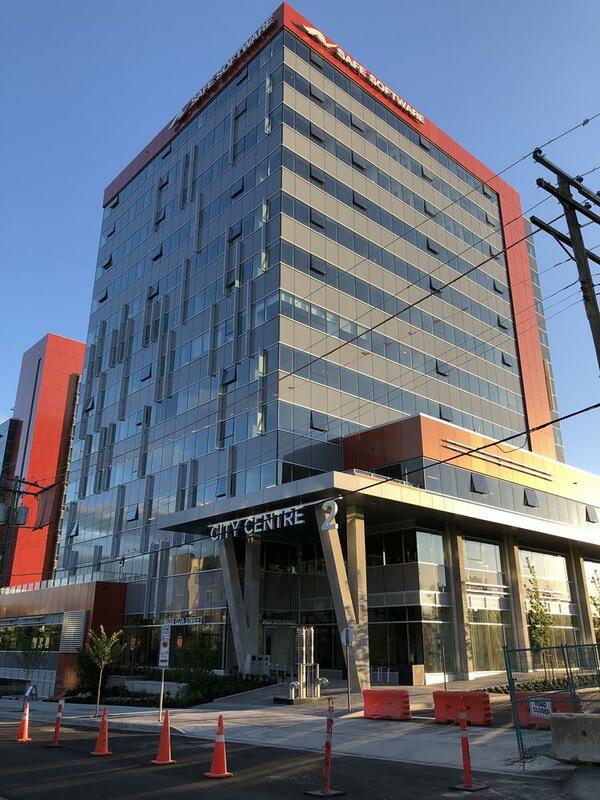 Lark Group’s City Centre 2 held its grand opening today following the completion of the 185,000 square-foot, 12-storey LEED Gold certified office building. 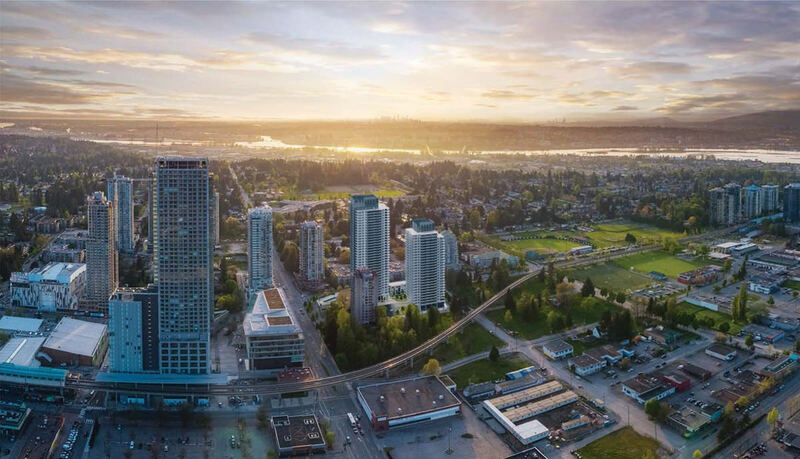 City Centre 2 is the second of 8 phases in Lark Group’s vision for an emerging Health & Technology District also referred to as ‘Innovation Boulevard’ just to the north of Surrey Memorial Hospital. Anchoring City Centre 2 will be Surrey-based Safe Software, who will occupy the top five floors of the tower. Their brand new office space includes a state-of-the-art 4,000 square-foot cafeteria, a 6,000 square-foot roof-top garden terrace and green space with a multi-level deck and walking path, a well as a fully equipped fitness centre and amenities for their employees. Illuminated signage for Safe Software was installed on the top of the tower earlier this year. In a speech at today’s opening ceremony, Lark Group president Larry Fisher indicated that construction could be underway on City Centre 3 as early as this summer. 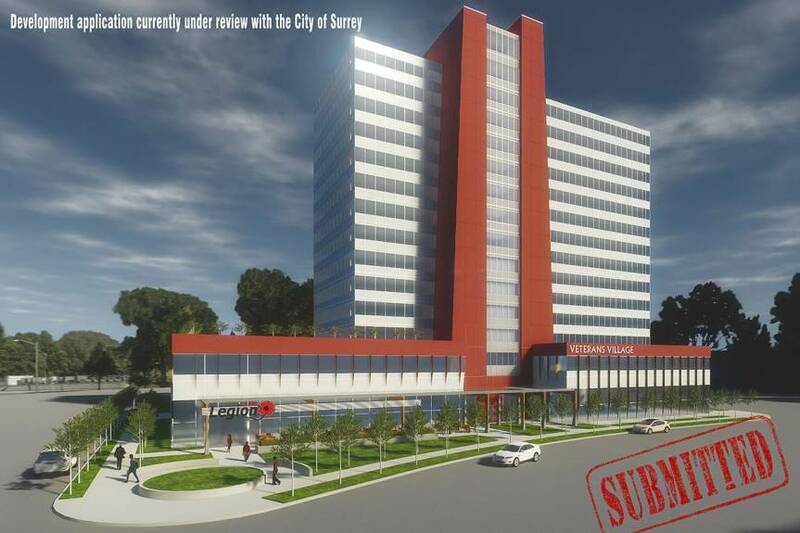 A 6-storey residential building proposed at the southern tip of City Centre near Surrey Memorial Hospital went to Council Monday night for 1st & 2nd readings. 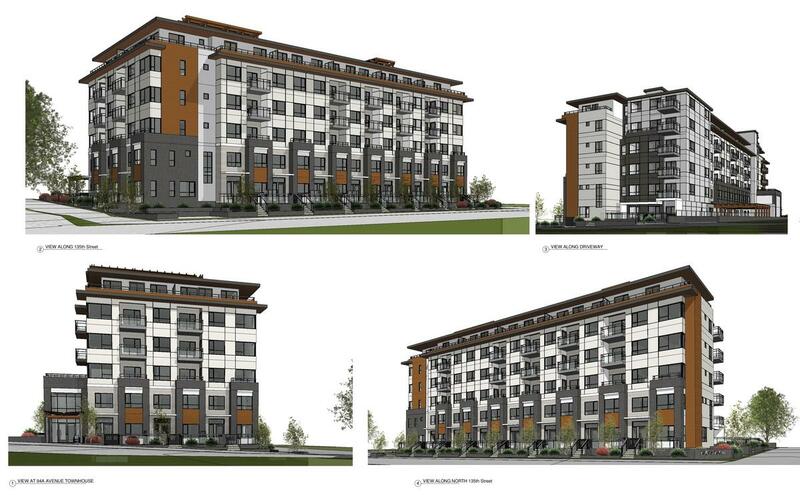 Located directly across from Queen Elizabeth Secondary School at 135 St & 94A Ave, the building will replace 3 existing single family homes built in the 1950’s. 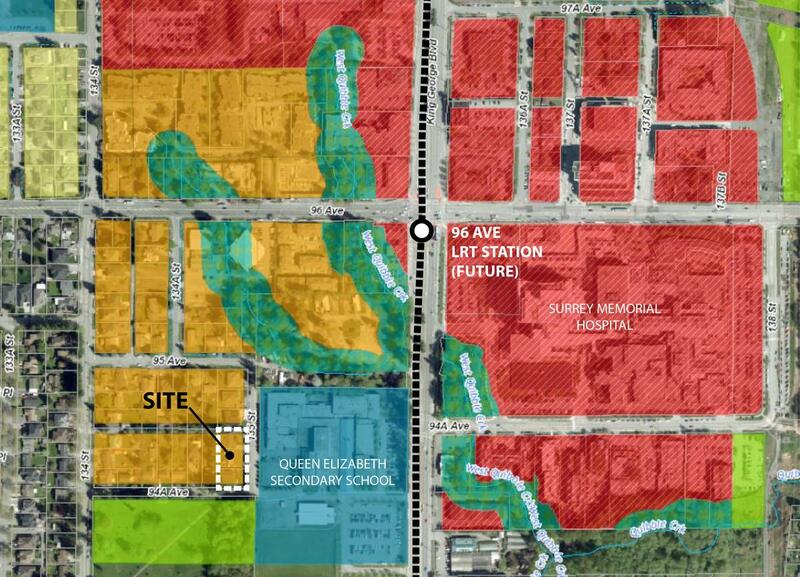 The area is envisioned to transform into a dense medical, health, and technology district surrounding Surrey Memorial Hospital, with similar 4-6 storey housing to eventually replace the remaining single family pocket west of King George Blvd and south of 96th Ave.
View looking south-east at corner of City Parkway and new 106A AveNew renderings were released this week of Lark Group’s upcoming ‘Veteran’s Village’ project – set to replace the existing Whalley Legion at 106 Ave & City Parkway. This latest design is the 4th redesign to be released publicly since the project was first announced back in 2015. Design ProgressionInitially, in 2015, the project was to feature twin towers resembling the Vimy Ridge Memorial in France. The design, by Michael Green Architecture, was noted to be conceptual at the time, and later proved to be a bit ambitious of an undertaking for the project. 2015 design for Veterans VillageIn late 2016, a new design was revealed for the project, scaling it back to a single building of lesser height, and less iconic of architecture, yet still featuring reference to the Vimy Ridge Memorial, and situated on a site surrounded by expansive plaza space. 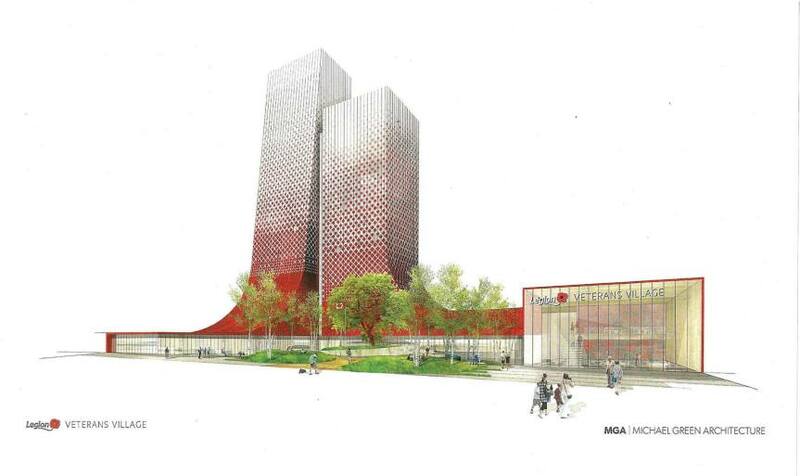 2016 design for a single tower projectA year later, in November 2017, an application was finally submitted for the project, but based on yet again, another redesign. This time, the project appeared to be scaled back even more. Much of the plaza space depicted in early designs had been eliminated, and the building’s architecture further simplified. 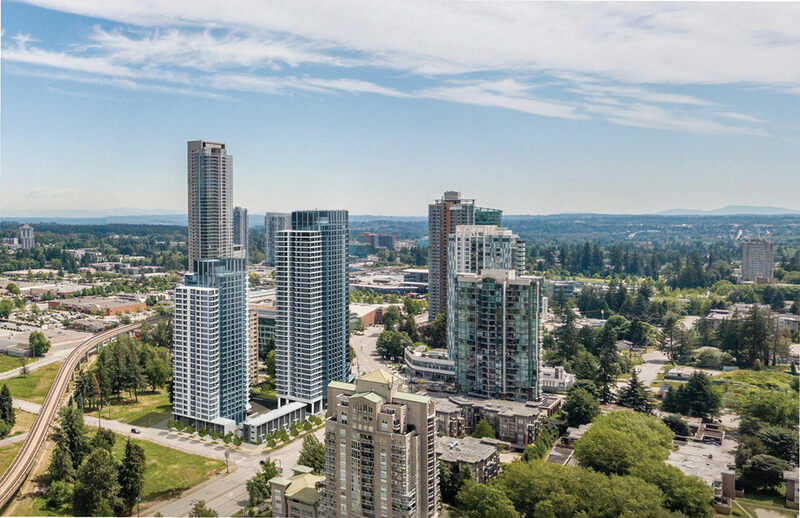 2017 Rendering looking east from City ParkwayNow, as of April 2018, a radical redesign has been released, showing a return to a 2-tower project, with a much more iconic, urban, and architecturally forward design. The tower has retained its reference to the Vimy Ridge Memorial through a creatively designed facade, and now fills out the block that it occupies in a much more urban form. 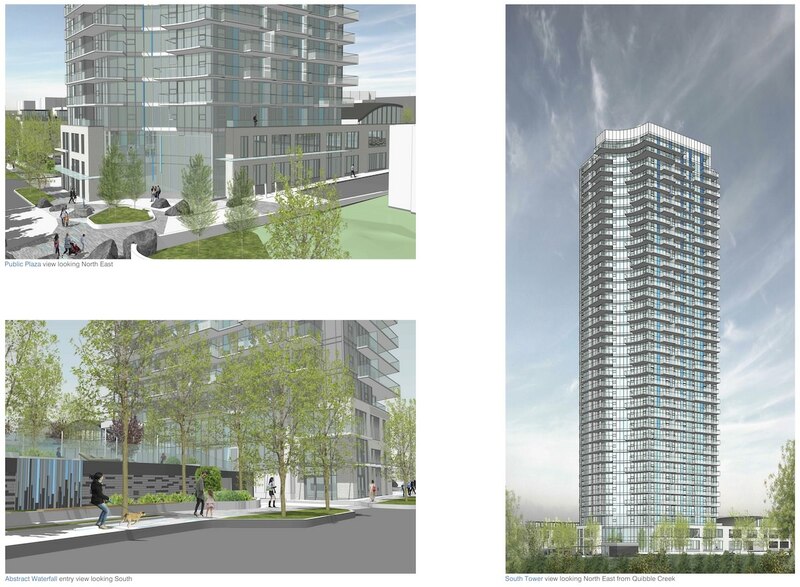 Wide sidewalks are depicted on both City Parkway and 106 Avenue with double rows of boulevard trees – in what looks to be intended as a quasi plaza space at the base of the tower, integrated with the sidewalk. 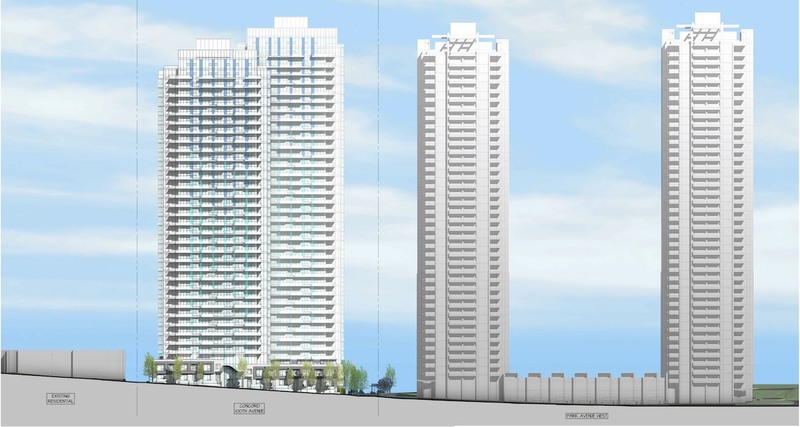 The tower heights have also changed – with the main tower depicted at 21 storeys and the tower behind at 27 storeys. 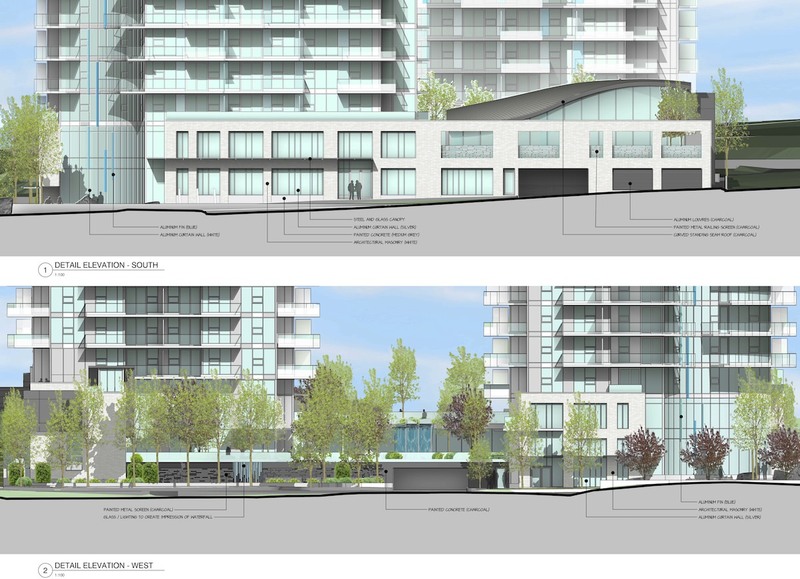 2018 design for Veteran’s Village looking north-east at corner of City Parkway and 106 Ave Project location with City Centre PlanWith this return to a 2 tower design, it is unclear whether the 2nd tower is an envisioned 2nd phase – or if both will be built at the same time and also serve the same use purposes. 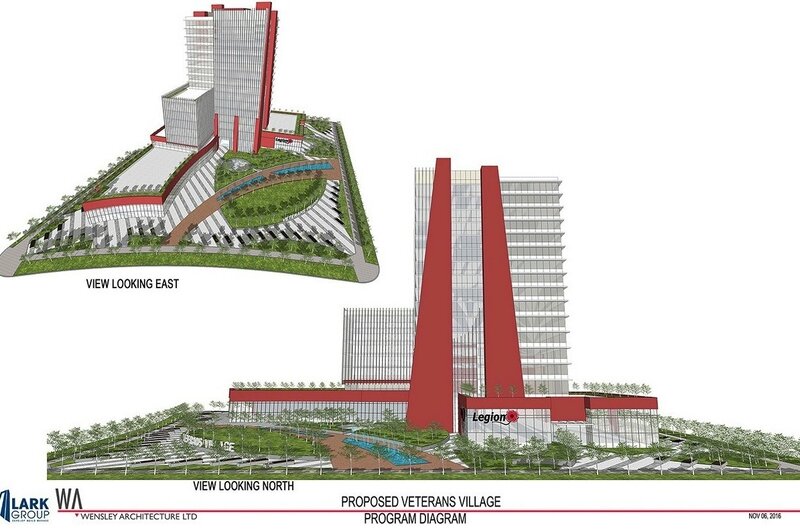 From Lark Group’s website, the project is described as the first of its kind in Canada, and will be:A multi-purpose facility designed as a centre of excellence in clinical and rehabilitation services for Veterans and first responders, with a mix of social and affordable housing. It will include space for research and delivery of health care programs, services and trauma counselling to address issues like PTSD. 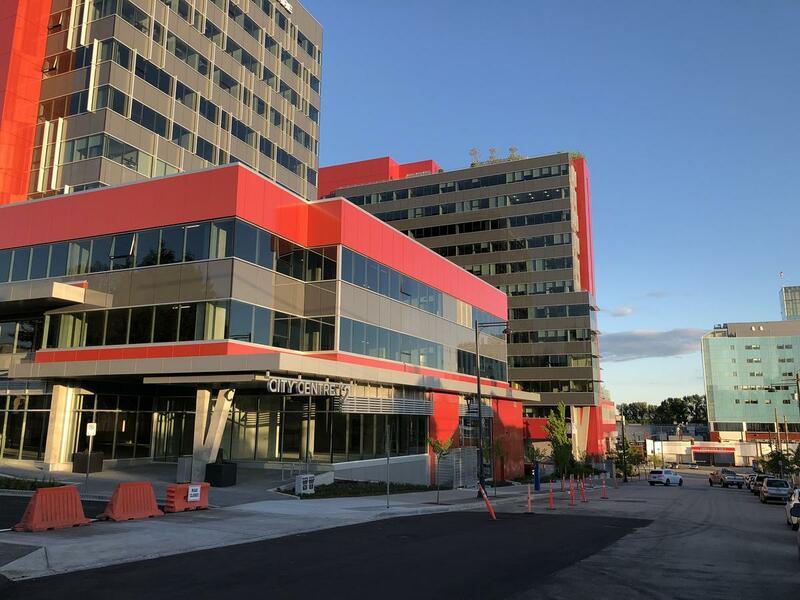 It will also provide clinical spaces to advance evidence-based services and programming in health, science and engineering, including innovations in robotics, assistive devices and exoskeletons for injured Veterans and first responders. 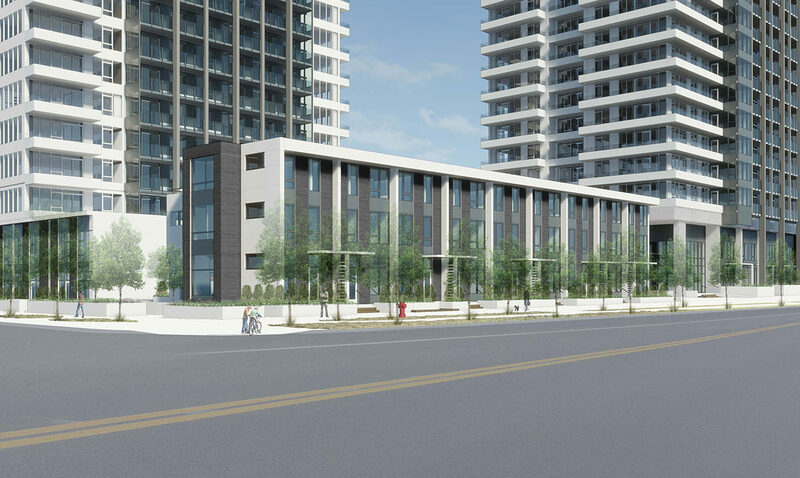 With the latest rendering release, it appears the project is getting closer to its final design, and it’s likely that it could appear before Council for preliminary approval in the coming months. Based on this, the project is likely to begin construction sometime in 2019.